Photos by Brandon Macz: The new State Route 99 Tunnel is set to open on Monday, Feb. 4. 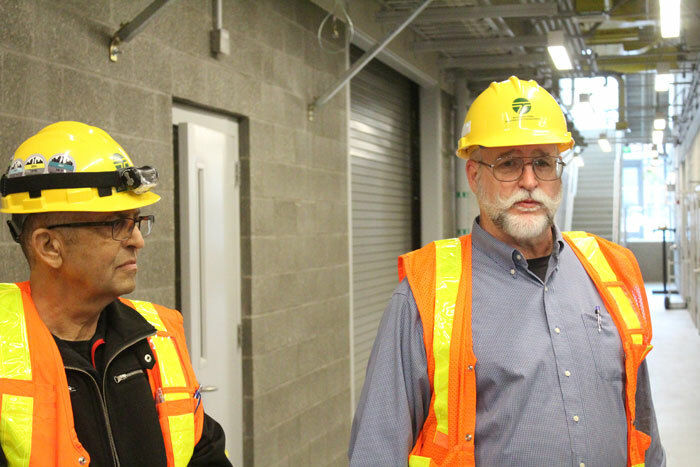 WSDOT maintenance and operations manager Chris Johnson and technical engineer Tareq Alzeera provided media a tour of the SR 99 Tunnel north operations building on Wednesday, Jan. 30. The fan room in the north operations building is larger than the one to the south, and it would be used in the event of a fire, pushing air through the tunnel. The SR 99 tunnel has maintenance access under the northbound level. In cases of emergencies inside the tunnel, people can get out of the tunnel by accessing egresses. Signs alert people as to how far they have to go to reach an exit on either end of the tunnel. 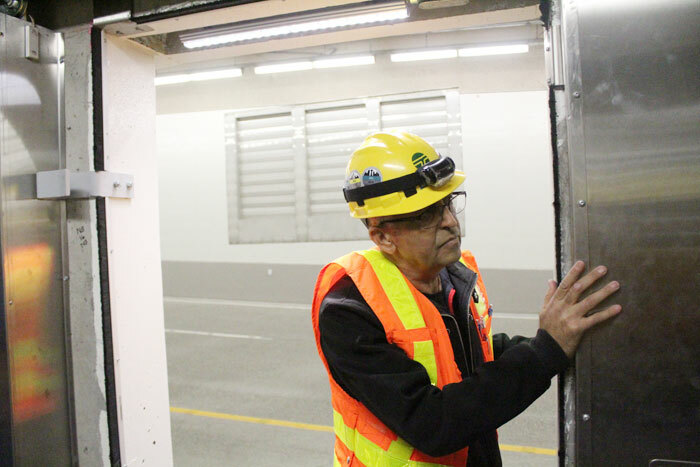 WSDOT technical engineer Tareq Alzeera opens an emergency door to one of the egresses inside the tunnel. The north portal exit, near the intersection of Harrison Street and Sixth Avenue North. 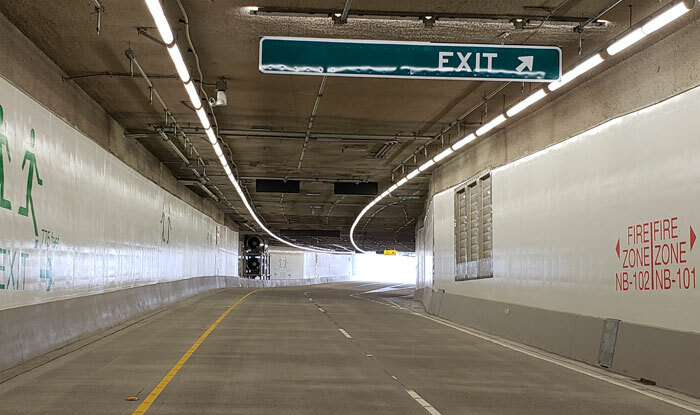 The new State Route 99 Tunnel set to open Monday was constructed to withstand a massive earthquake, but that doesn’t mean there will never be an emergency inside. WSDOT maintenance and operations manager Chris Johnson and technical engineer Tareq Alzeera provided media a tour of the tunnel operations building at the north end of the two-mile structure on Wednesday, Jan. 30, as well as the maintenance route 80 feet below. There are two tunnel operations buildings, one to the north and another to the south, the former housing a control room for real-time responses. When that’s not manned, directions will come from the WSDOT Traffic Management Center in Shoreline. 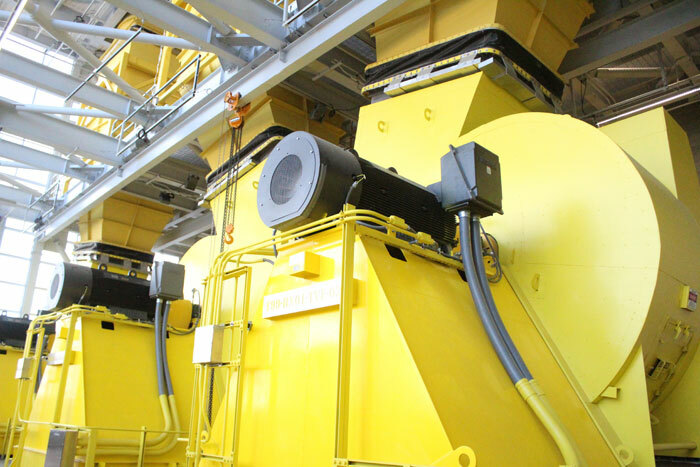 Each end of the tunnel has a Seattle City Light substation that powers the tunnel’s many safety, operations and security systems, as well as an emergency battery system and generator room. “We hope these never have to run,” Johnson said. Vents inside the northbound and southbound levels on the tunnel would remove the smoke. “The system functioned exactly as it was designed to do,” Alzeera said of two live drills conducted with Seattle Police and Fire. Johnson said the fire department pushed for the second test, concerned the fans couldn’t keep up with the smoke, but firefighters were unable to overwhelm the system. No flammable liquids, such as those carried by tanker trucks, will be allowed in the tunnel, as it does not have firefighting foam in its suppression system like the Interstate 90 tunnel. The deluge fire suppression system can release 3.2 gallons of water per second. 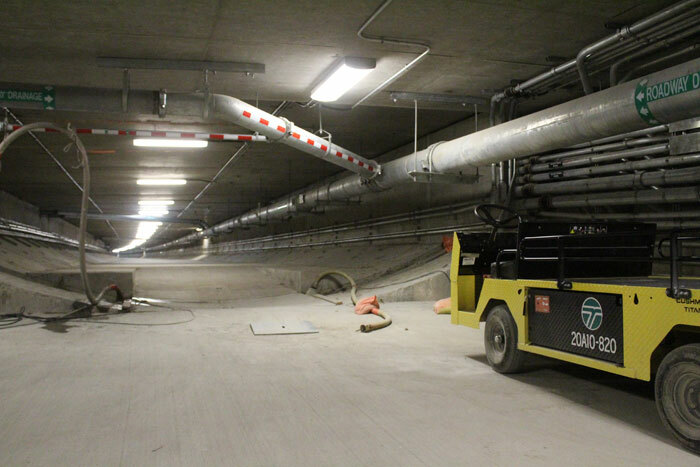 The tunnel has eight miles of linear heat detectors and four miles of drainage pipes. Many of the SR 99 Tunnel systems are accessed by staff in a maintenance level below the northbound section; the southbound traffic lanes are on top. Using small electric carts, maintenance staff can bypass traffic to get from one side of the tunnel to another, Johnson said. There’s a wide emergency lane for vehicles to use in the event of a breakdown or accident on both levels of the SR 99 Tunnel, and motorists are encouraged to stay with their cars. 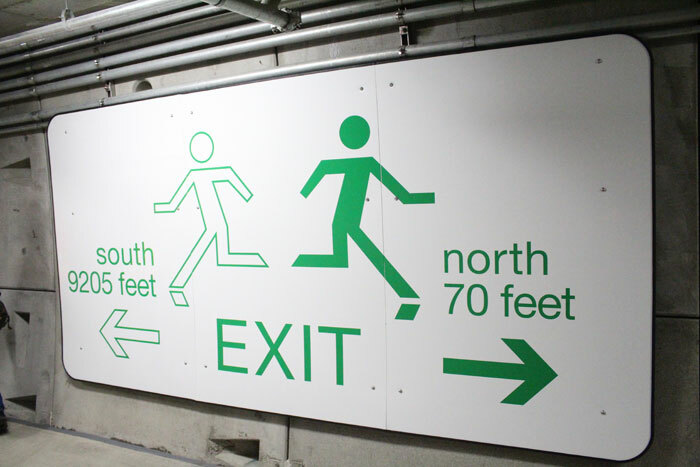 But if a fire does break out in tunnel, there are 16 emergency fire doors on each level that people can take into egresses that will lead to stairs that exit outside. There are emergency phones inside the tunnel and in the refuge areas, with panels informing people how far it is to exit from either end. People with mobility issues can wait in the emergency egresses until first responders arrive. The tunnels are more heavily lit at the entries, so people’s eyes can adjust, Johnson said, and then lighting dims further along the route. Johnson said the tunnel is essentially complete, while David Sowers, Alaskan Way Viaduct Replacement Program deputy administrator for WSDOT, said on Tuesday the rest of SR 99 is expected to be finished in time to open the tunnel to traffic on Monday, Feb. 4. 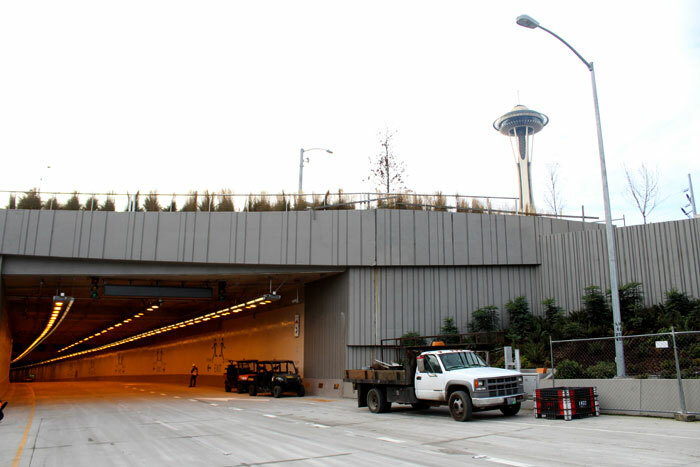 It will still be at least another week before the northbound off-ramp to Alaskan Way opens, meaning there won’t be an exit before entering the tunnel. People not wanting to get stuck driving the length of the tunnel should exit ahead of time. The Battery Street Tunnel closes permanently at 10 p.m. Friday, and will be filled with rubble from the Alaskan Way Viaduct when demolition starts in mid-February.